Today is an AMAZING day! The sun is out, the snow is melted, it's 70* and I am on my porch, drinking coffee and blogging! WOW! I have missed this! Another reason that this is such a great day is because I spent the morning getting creative in my kitchen. In January, we purchased a deep freezer and a 1/4 of beef. I am so blessed to say that I have more red meat than I know that to do with. This has allowed me to play around little though, and tonight's meal is the result of that. 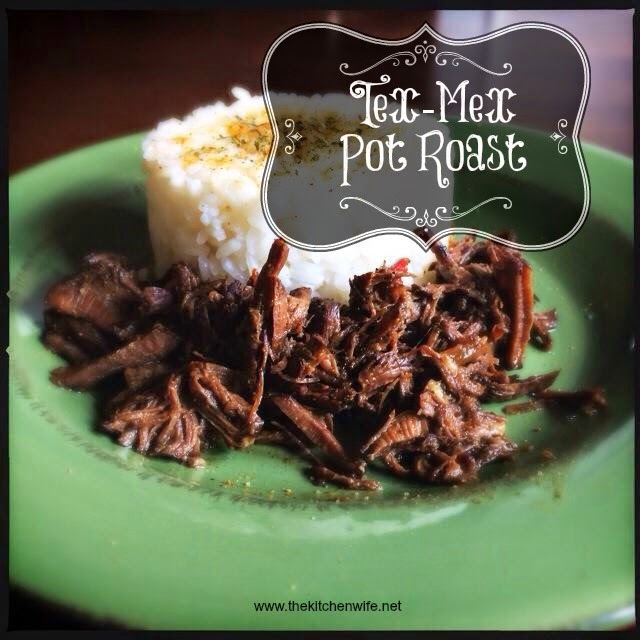 I know many of us make and love pot roast. It is simple to prepare, hearty, and you can put it in the crock-pot in the morning and be eating when you get home. Yes, pot roast is an American staple. I don't know about you though, but sometimes, I get tired of the same old pot roast. So tonight, I decided to spice things up a bit and make a Tex-Mex Pot Roast. I was sure no one had ever heard of this before, but I Googled it, and sure enough...it was there. HOWEVER, no one, that I saw, is making it like this. And did I mention I am going to get THREE DIFFERENT meals out of this? So here it is...MY Tex-Mex Pot Roast! Let's get the Tex-Mex Roast Rollin'! To begin, you will want to season BOTH sides of the roast generously with salt and pepper. Look at that beautiful bone in the center of my roast. Oh the scrumptious flavor that little guy is going to add! After the roast is seasoned, add 3-4 tbsp. of oil to a pan and heat it up over a high heat. When the skillet is SCREAMING HOT, sear the roast for two minutes on each side. This helps to seal in moisture and add extra flavor. You don't have to sear your roast, but I just don't know why you wouldn't. Once the meat is seared, place it in your slow cooker. Then, in the skillet, that is still over the fire, add your beer or beef broth. Using a wooden spoon or your tongs, scrap up all the lovely brown bits from the bottom of your pan. Then pour over the roast in your slow cooker. What you have done is called deglazing and you have created some SERIOUSLY GREAT flavor! Now you will need to slice the onion. Place it in your slow cooker, over the roast. Add the Ro-Tel tomatoes and mix around a bit. Cover the slow cooker, turn on low, and allow to cook for 6-8 hours. 6-8 hours later you will have this luscious hot tub of flavor! Remove the roast to a baking sheet. It will be tender, so it is okay if it falls apart. Using two forks, gently shred your roast. I would HIGHLY recommend trying a piece. The flavor is out of this world! This next step is not necessary, but I prefer to do this. Strain the liquid from the slow cooker into a bowl, using a sieve to catch all the vegetables. For me, they have done their job and I am finished with them. Feel free to add them back to the slow cooker if you like though. You will need to allow the liquid to set for a moment and give the fat a chance to rise to the top of the bowl. Skim off. You can use a fat separator, as I have in the photo above. Season your roast generously with salt and pepper. Sear roast for 2 minutes on each side. Then put in slow cooker. Add your beer or beef broth to the hot skillet to deglaze and pick up all that flavor off of the bottom of the pan. Add the onion, and spices to slow cooker. Add the tomatoes and orange juice to slow cooker. Put lid on your slow cooker and turn on low. Allow to cook 6-8 hours. Remove roast to cutting board or baking sheet. Allow fat to rise to the top, skim, and return to your slow cooker. You can also just use a fat separator. shred your beef and return to slow cooker. *You do not have to sear your meat. You can add it directly to your slow cooker, but searing and deglazing the pan adds flavor. *You do not have to drain your broth and remove the fat. That is my preference. Either way it will be delicious. This can be served on tacos, nachos, in quesadillas, burritos, enchiladas, or with a side of rice! ENJOY!